Scalia left his mark on the judicial branch of the U.S. government over the course of his 33 years in the public eye. The many bipartisan tributes pouring in after his death at the age of 79 have praised his intellect, wit and dedication to public service. InsideGov digs into Scalia’s personal history and record on the court to find 25 essential facts and figures that defined his life and career. We’ve looked at it all, from his guest turn in an opera to that time he made a list of potential vice presidential candidates, ranking everything from the smallest to largest figure. 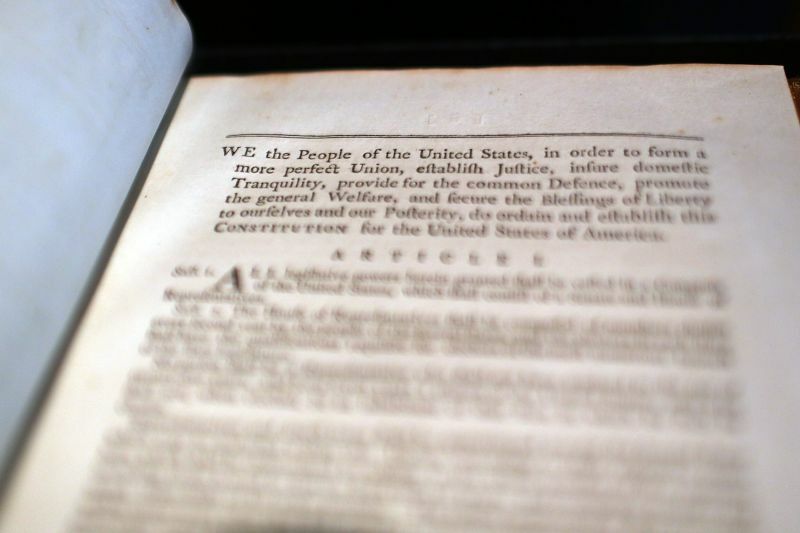 Scalia was a strict constitutionalist, articulating that the Constitution was “not a living document.” Instead, Scalia said the document is “dead, dead, dead” and must be read exactly as the Founding Fathers wrote it. Scalia and his fellow Supreme Court justice, Ruth Bader Ginsburg, rode on an elephant together in India in 1994. The two justices, on opposite ends of the ideological spectrum, were “best buddies,” according to Ginsburg’s tribute to Scalia following his death. Before he was appointed to the Supreme Court, Scalia served as the assistant attorney general under former President Gerald Ford. During that time, he argued his only case in front of the Supreme Court, Alfred Dunhill of London Inc. v. Republic of Cuba. The case looked at how to handle cigar manufacturing profits after Cuba nationalized U.S. businesses in 1960. Scalia argued for Dunhill, and won. In 2008, Scalia penned the majority opinion for the District of Columbia v. Heller case, which argued the Second Amendment provides Americans with the right to gun ownership. Scalia wrote that the “militia” referred to in the amendment pertains to individuals, not just the military. Heller was one of the five cases 2016 Republican presidential hopeful Sen. Ted Cruz won at the Supreme Court during his tenure as the Texas solicitor general. Scalia and Ginsburg, both opera aficionados, made joint guest appearances in performances of Richard Strauss’s “Ariadne auf Naxos” in 1994 and 2009. 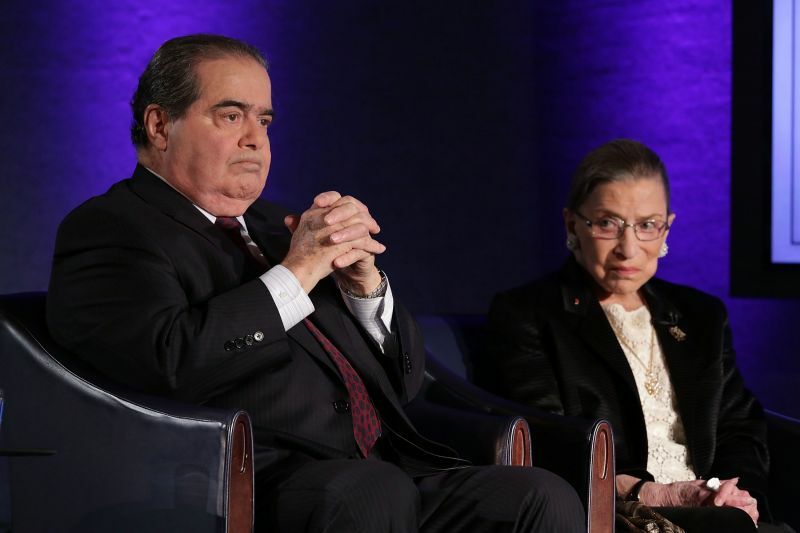 Their long friendship inspired a one-act comic opera, “Scalia/Ginsburg,” which premiered in July 2015. A verbose and colorful writer on the bench, Scalia penned three books, starting with his 1997 tome, “A Matter of Interpretation.” He co-wrote his next two with Bryan Garner, a lawyer and legal scholar on language. In 1982, former President Ronald Reagan appointed Scalia to the United States Court of Appeals for the D.C. Circuit. During his four years in that role, Scalia developed his distinctive, sharp writing style that he became known for. In a 5-3 vote in Hamdan v. Rumsfeld, the Supreme Court ruled against military commissions for detainees at Guantanamo Bay. In the run-up to arguments at the court, five retired generals asked Scalia to recuse himself because of comments he made during a speech a few weeks earlier in Switzerland. He said foreigners who waged war on the U.S. had no rights under the Constitution. Salim Ahmed Hamdan, who said he was Osama bin Laden’s driver and was designated an “enemy combatant” by the U.S., questioned the military commissions. Scalia was part of the three-person dissent in the case. According to data from OnTheIssues, Scalia was the most conservative justice on the bench, coming in at 5.25 on the scoring scale. OnTheIssues’ scores range from negative 10 (very liberal) to positive 10 (very conservative). Scalia’s more moderate views on international and economic issues helped to average out his very conservative perspective on individual rights. Scalia was part of the majority in the 2000 case Bush v. Gore, which stopped the recount in Florida and ultimately led to George W. Bush assuming the presidency. The case was split into two questions, about the constitutionality of the way the votes were counted and the feasibility of a recount. By a 7-2 vote, the court found there was a violation to the Equal Protection Clause when different standards of vote counting were used in different counties in Florida. The court also found, in a 5-4 decision, that a recount couldn’t happen in a reasonable timeframe. Scalia and his wife, Maureen McCarthy Scalia, had nine children, but the grandkid tally varies: some news outlets count 36 grandchildren while others count 28. Scalia himself was an only child, and was the lone kid of his generation within his larger family, as his parents’ siblings didn’t have any children. Scalia served on the Supreme Court for almost 30 years. Former President Ronald Reagan appointed Scalia to the high court in September 1986. The flags in the plaza in front of the Supreme Court will fly at half-staff for 30 days after Scalia’s death. Every year, Scalia and Ginsburg celebrated New Year’s Eve together. Scalia called the pair “the odd couple” during a 2015 speech at George Washington University in D.C.
Scalia was 50 years old when the Senate confirmed him, making him the youngest justice on the Supreme Court at the time. When he was among the dissenting votes on a case, Scalia wrote an opinion 54 percent of the time. In the last 62 years of the Supreme Court’s history, Scalia is the third justice to die while in office. Justice Robert H. Jackson died in 1954 and Chief Justice William Rehnquist died in 2005. Scalia was one of six Roman Catholics on the Supreme Court, meaning two-thirds of the current justices subscribe to that faith. The remaining three justices are all Jewish. Although perhaps best known for his staunch conservatism, Scalia was also known for his sharp wit, in his writing and during arguments. According to a study of transcripts from the Supreme Court’s 2004-2005 term, Scalia inspired 77 bouts of laughter during oral arguments — by far the most among his colleagues. It took 85 days for Scalia to go from Supreme Court nominee to confirmed justice. During his Senate confirmation in 1986, Scalia received 98 votes — the second-highest margin since 1970. Former Justice Sandra Day O’Connor received 99 votes in 1981. For his undergraduate degree, Scalia studied history at Georgetown and graduated at the top of his class. He then studied law at Harvard Law School. 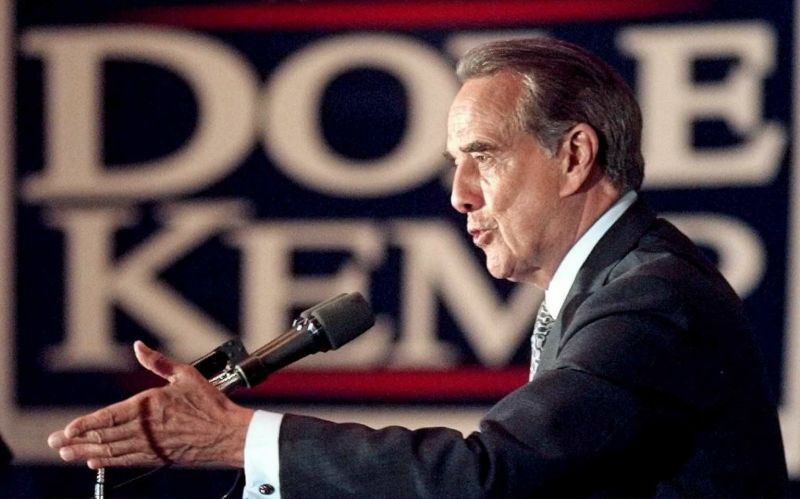 When former Senate Majority Leader Bob Dole, R-Kan., ran for president in 1996, Rep. John Boehner — then the head of the House Republican Conference — “tried to persuade” Scalia to run as Dole’s vice president. Scalia declined, and Jack Kemp, a longtime congressman out of New York, ended up joining the ticket.